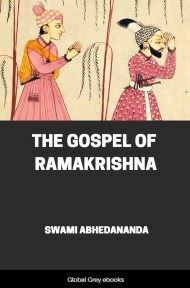 With over 60 illustrations, this is a comprehensive study of Hindu mythology during the Vedic and Puranic periods. 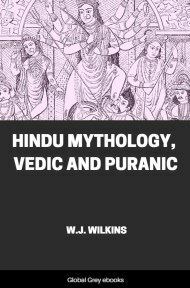 Wilkins starts with the very earliest pantheon of the Vedas, such as Surya, the storm-god Maruts, Agni, Soma, Yama, and the dawn Goddess Ushas. From there he moves into the later, and very intricate, Puranic mythology. 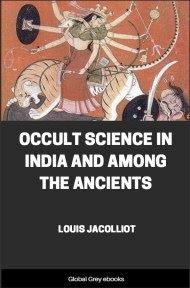 This includes detailed treatment of the central triad of Brahmâ, Vishnu and Shiva, along with dozens of other Gods and Goddesses, nature spirits, half-divine heros of the epics, and so on. Before speaking of the Vedic Deities, it is necessary that something be said concerning the Vedas themselves, the source of our information concerning them. The root of the word is vid, "to know;" hence the term Veda signifies knowledge; and as these books were not written for centuries after they were originally composed, it signifies knowledge that was heard, or orally communicated. The Vedas are not the work of a single person, but, according to popular belief, were communicated to a number of Rishis or saints, who in their turn transmitted them to their disciples. The Seer Vyāsa is styled the arranger, or, as we should now say, the editor, of these works. The instruction contained in these writings is said to have been breathed forth by God Himself. Other writers teach that it issued from Him like smoke from fire. Sometimes the Vedas are said to have sprung from the elements. The accounts of their origin, though differing in form, agree in teaching that they were the direct gift of God to man; and hence they are regarded with the greatest veneration. They are the special property of the Brāhmans. As early as Manu, the nominal author or compiler of a law book probably not more than two or three centuries later than the Vedas, though some suppose it to have been no earlier than A.D. 500, it was regarded as a grave offence for a single word of these divinely given books to be heard by a man of a lower caste. The Vedas are four in number; of these the Rig-Veda is the oldest, next in order was the Yajur-Veda, then the Sama-Veda, and last of all the Atharva-Veda. 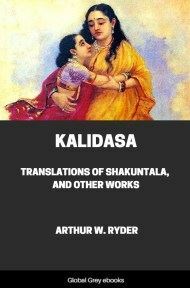 Each of these Vedas consists of two main parts: a Sanhita, or collection of mantras or hymns; and a Brāhmana, containing ritualistic precept and illustration, which stands in somewhat the same relation to the Sanhita as the Talmud to the Law. In these are found instructions to the priests who conduct the worship of the gods addressed in. the hymns. Attached to each Brāhmana is an Upanishad, containing secret or mystical doctrine. These are regarded as of lesser authority than the Mantras and Brāhmanas. For whilst they are spoken of as Sruti, i.e. heard, the Upanishads are Smriti, learned. Though based on the older compositions, if there is any discrepancy between them, the teaching of the later ones is rejected. The Sanhita and Brāhmana are for the Brāhmans generally; the Upanishads for philosophical inquirers. Yet, strange to say, whereas the older portions had, until recent years, been almost entirely neglected, with some parts of the Upanishads there was considerable acquaintance amongst the learned pundits of Benares and other places. In many parts of India not a man could be found able to read and interpret them. Of the Sanhitas, the "Rig-Veda Sanhita—containing one thousand and seventeen hymns—is by far the most important; whilst the Atharva-Veda-Sanhita, though generally held to be the most recent, is perhaps the most interesting. Moreover, these are the only two Vedic hymn-books worthy of being called separate original collections;" the others being almost entirely made up of extracts from the Rig-Veda. Between the time of the composition of the Rig-Veda and that of the Atharva, considerable changes in the religious faith of the people had come about. The childlike trust of the earlier hymns has disappeared, and the deities now seem more cruel, and there is greater need of propitiatory offerings. Probably the old religion of the people whom they had conquered had begun to tell on that of the Aryans. The Sanhitas of three of the Vedas are said to have some peculiarity. "If a mantra is metrical, and intended for loud recitation, it is called Rich (from rich, praise) whence the name Rig Veda; i.e. the Veda containing such praises. If it is prose (and then it must be muttered inaudibly), it is called Yajus (yaj, sacrifice, hence, literally, the means by which sacrifice is effected); therefore Yajur-Veda signifies the Veda containing such yajus. And if it is metrical, and intended for chanting, it is called Sāman [equal]; hence Sāman Veda means the Veda containing such Samans. The author of the Mantra, or as the Hindus would say, the inspired 'Seer,' who received it from the Deity, is termed its Rishi; and the object with which it is concerned is its devata—a word which generally means a 'deity,' but the meaning of which, in its reference to mantras, must not always be taken literally, as there are hymns in which not gods nor deified beings, but, for instance, a sacrificial post, weapons, etc., invoked, are considered as the devata. It should, however, be noticed that the deifying of a "sacrificial post" or a "weapon" is in perfect harmony with the general pantheistic notions which prevailed amongst the people then as now: so that there is nothing unnatural according to their religious ideas in speaking even of inanimate objects as deities. There is little doubt that the Brāhmanas are more recent than the Sanhitas. The Vedas have not come down to the present time without considerable dispute as to the text. As might have been expected, seeing that this teaching was given orally, discrepancies arose. One account mentions no less than twenty-one versions (Sākhās) of the Rig-Veda; another gives five of the Rig-Veda, forty-two of the Yajur-Veda, mentions twelve out of a thousand of the Sāman-Veda, and twelve of the Atharva-Veda. And as each school believed that it possessed the true Veda, it anathematized those who taught and followed any other. The Rig-Veda Sanhita that has survived to the present age is that of one school only, the Sākala; the Yajur-Veda is that of three schools; the Sāma-Veda is that of perhaps two, and the Atharva-Veda of one only. "The history of the Yajur-Veda differs in so far from that of the other Vedas, as it is marked by a dissension between its own schools far more important than the differences which separated the school of each [of the] other Vedas. 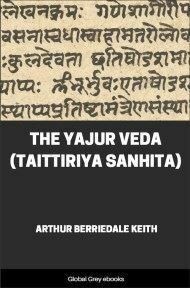 It is known by the distinction between a Yajur-Veda called the Black—and another called the White—Yajur-Veda. Tradition, especially that of the Purānas, records a legend to account for it. Vaisampāyana, it says, a disciple of Vyāsa, who had received from him the Yajur-Veda, having committed an offence, desired his disciples to assist him in the performance of some expiatory act.